A Neapolitan-style pizzeria and Italian bistro. 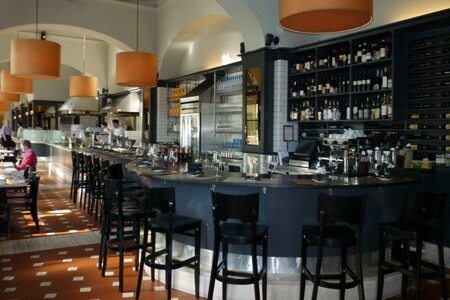 : Pizzeria Ortica is more than just a place to enjoy thin-crust pizzas. This spot, which sits within walking distance of Segerstrom Center for the Arts, Segerstrom Hall and South Coast Plaza, feels like a real Italian bistro with its tile floors, soaring ceilings, Palladian arched windows and sidewalk terrace. At lunch, most business types come for the two-course special, giant entrée salad, or the crisp and smoky pizzas made with rustic toppings such as crushed San Marzano tomatoes, house-made sausage, wild arugula and fennel pollen. At dinner, pull up a seat at the relaxing bar pre-meal and enjoy a drink from the bar's highly innovative cocktail program. Once you settle into your seat after that, order up a cold antipasti dish for sharing. The restaurant's main courses are a blend of straightforward, finely-crafted Italian favorites like pappardelle with lamb ragù, along with contemporary delights such as steamed PEI mussels with leeks, chiles, mint and garlic crostini. (Former chef Justin Miller has parted ways with Pizzeria Ortica.) Desserts are also worth trying --- think chocolate caramel budino and affogatos.